China’s emergence in the 21st century to the status of great power has significant implications for its relationship with the United States, the sole superpower in the post-Cold War World. Now that China is rising as an economic, political, and military power and has expanded its diplomatic activism beyond Asia into Europe, Latin America, Africa, and the Middle East, its rise has profoundly transformed its relationship with the US and compelled leaders in both countries to redefine their positions toward each other. 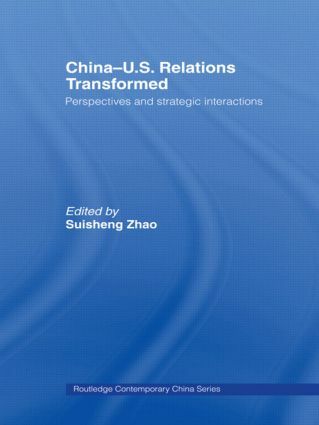 This book, written by leading scholars and policy analysts from both the US and China, explores the transformation and multifaceted nature of US-China relations, including how the political elite in both countries have defined their strategic objectives in response to China’s rise and managed their relations accordingly. It provides an up-to-date analysis on the policy adjustments of the last decade, and covers all the important issue areas such as security, nuclear deterrence, military modernization, energy, trade and economic interaction, and Asia-Pacific power reconfiguration. It does not seek to confirm either an alarmist or optimistic position but presents different views and assessments by foreign policy specialists with the hope that leaders in Washington and Beijing may make positive adjustments in their policies to avoid confrontation and war. It will also be an invaluable resource for students and scholars of US and Chinese politics, international relations and comparative politics. Comparing security concepts of China and the U.S.A.
Chinese military modernization and energy security: Conflict or cooperation? China’s economic rise: Implications for the U.S.A.